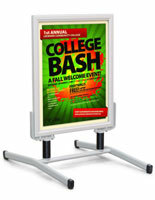 These Weather-Resistant Sign Supplies With Space For Two Posters Give Your Indoor and Outdoor Displays A Fresh, Modern Look! Buy Sign Supplies Thousands In Stock In Our Massive E-Catalog! Want to entice more customers into your business and raise spur of the moment sales? 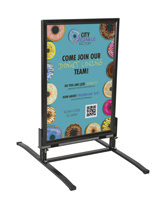 Sign supplies and other outside poster displays are designed for intriguing onlookers and convincing them to come into your shop. 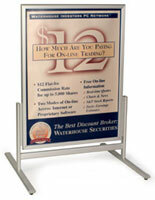 With picture holders on both sides, these sidewalk signs are double-sided for the most advertising exposure around. Grab the curiosity of clients both coming and going! Engineered especially for outside usage, these impervious sign supplies with sleek construction incorporate a long-lasting composition which is made to withstand many weather conditions. Utilize your curb signs in front of eateries as menu displays, or shop fronts to publicize sales and promotions! 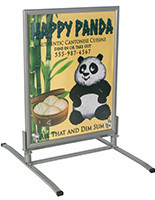 To expand the effects of these publicizing subject matters, our company sells these sign supplies as double-sided showcases. 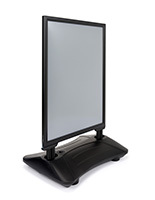 Two clip-open picture holders hold back-to-back signage, so you are able to gain attention from all angles. 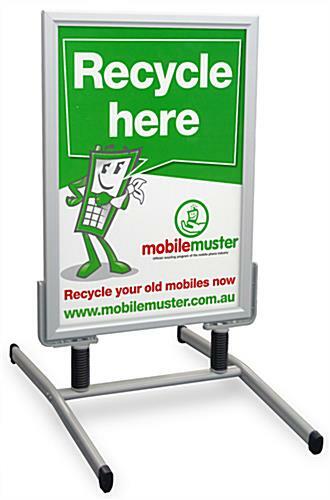 To load your roadside signage with appealing images, simply clip open the four edges, put your visual graphic inside and clip shut! With a satin metal finish and sharp lines, these sign supplies are fashionable showcases that look fantastic in any setting. While these sign supplies were especially engineered to endure outside usage, these curb signs are equally excellent in interior environments as well. Even better, these quality sign supplies for sale only need a small amount of work to assemble. Just align the holes in the springs with those on the base, and use the provided screws to connect. It's that simple! These sign supplies, likewise known as curb signage, have been engineered to withstand climate and decrease the chances of blowing over in the breeze. 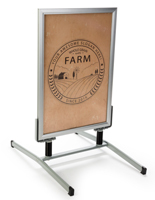 With a metal composition and stable base, these professional sign supplies that display outdoors are steadfast, yet easy to carry and moveable. 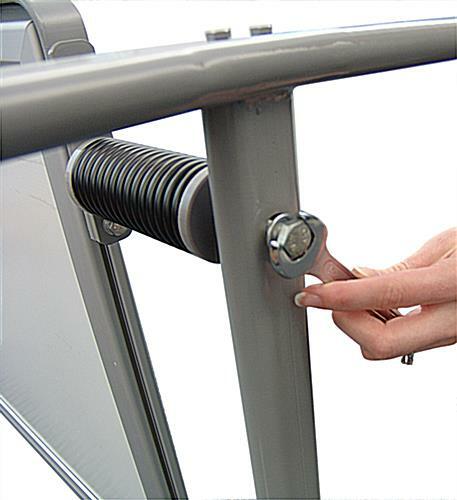 High elastic springs connect the picture holders to the base, and minimize the impacts of wind. 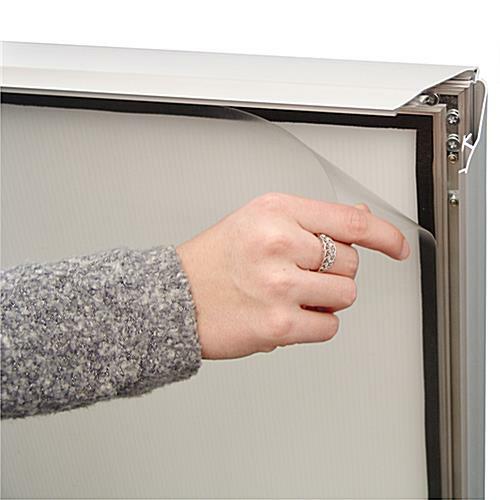 To maintain the condition of your signage and media content to keep them appearing fresh and new, these sign supplies also incorporate clear, non-glare protective lenses. Please Note: While the snap frames and lenses work to seal out moisture, your signage may become ruined if utilized in extremely harsh circumstances like heavy rain and snowstorms. 27.1" x 45.0" x 36.0"
25.0" x 8.5" x 1.5"